Well here we are with our first Queens birthday long weekend Aero Tow & Fun Fly. What started out as a question, “What are you doing for the long weekend?” has turned out to be an awesome fun weekend of aero modeling to the highest level. 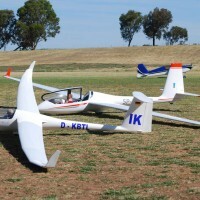 A couple of phone calls and a couple of adds on (http://www.scalesoaring.com.au/ & http://www.mmac.asn.au) has started what will probably be known as “Cobram Queens Aero Tow & Fun Fly”. The forecast for the weekend was for crisp cool air in the morning building up to warmer air with a top of 17deg for Saturday 18deg Sunday and 18deg for Monday with some high level cloud passing through. As I’m only newbie to the whole scale aero towing scene I wasn’t sure what to expect with the gliders so I packed my newly acquired H-models scale ASG-29, (big thanks to Henryk for assembling an awesome model) my trusty MD500 scale heli, my 80” electric zero and combat and night fliers just in case. As Saturday morning progressed the cars rolled in with models from all facets of the hobby. There where helicopters, large scale warbirds, trainers, electric models, ducted fans, biplanes and of course some large scale gliders and tugs not to mention quite a few night flyers. The first person in the air was one of our new club members David Millward with his radian sniffing out any secrets of the field prior to any of the other glider boys getting there. Welcome to the club David, great to have you on board. The next to hit the air, or should I say ”chop the air”, were Allan Foster & Gary Busby with their aggressive electric helies. What a show they put on, I can’t believe the rotor blades don’t snap off these models. Gary also showed off his new 50-size scale MD500 with some nice scale flying it really looked the goods. Great show guys. As the day started to warm up out came the gliders and tugs, K8’s, ASW-15 5m, Salto 4m, Ventus 2ax 5m, K6 4m, ASK14 5m, CMPro DG1000 2.6m and my new ASG-29. As the day drew to an end I arranged a roast for dinner and sweets. With the daylight falling away and a full belly, someone made the call for “night fliers”. Out came 10 to 12 models all eager to partake in the night flying action. What a fun night – I had to retire to the club house to get rid of the smiley cramps! It was just some good old fashioned fun and I still can’t believe how quickly midnight came round. Sunday morning awoke to a glorious picture perfect sunrise with a fine crisp mist overlay. The morning soon warmed up to an absolutely magical day. Again the helies and all the electrics put on a dazzling display throughout the day. Good old Pugnee (a true work horse) maintained a stella job with Neil Spencer and yours truly piloting her towing up the larger gliders. I had a go at towing up Peter Hills’ 6m K8 (boy you know when your pulling that big ship) until she got the radio hebiegebies and was forced to retire leaving the towing up to Colin Booth and Steve Lunney. Steve’s DA50 powered extra surprised us all by pulling up the larger models – great job Steve. Colin Booth had his cherry broken this weekend with his scratch built Cadet DA50 powered model. What started out as a nervy initial undertaking became a great achievement for Col as he towed up the smaller K8’s, DG1000 & Grob G103C – well done Colin. More and more MMAC Club members are coming out with aero tow gliders with the addition of Bill Scholtes and his 3.5mtr K8 and Frank Rettke with his refurbished 2.7mtr Grob G103C Well done guys, lets hope more members give it a go. I also hear on the bush telegraph that Chris Graham has an e-flight Blanik on the way (can’t wait to see that one). Thanks to all the participants who made this weekend so successful, to Oz scale soaring for advertising and to Andy Smith for some magnificent pictures. The event was good old fashioned mates having fun. I’m in no doubt that this will become an annual fun fly and only get bigger. As a new member of the Moira Model Aircraft Club inc, I was eager to see the field. With the weatherman’s forecast of a beautiful weekend I left on Friday evening after work. The weather man was spot on a beautiful weekend. No wind to speak of and blue skies with a few wispy high altitude clouds. I was immediately impressed with how smooth the landing strip was. Out with the trusty Radian to find if the early morning warmth gave away any secrets of the field?? With the land fill about 300m from the field there was soon a few local birds showing where there was weak lift. As the day warmed more and more weak but even lift appeared and out came the Discus 2C. I was a little apprehensive about getting towed as my last outing at Warracknabeal ended with an unceremonious ground loop as a gust came from my left. (Thanks to H for the Pizza, Red Wine repair nights!!). Later in the afternoon the lift improved again and it was off to the flight line with the 2C. JasonSagaidak was the tug pilot with Neil Spencer kindly tutoring my tow and landing. On a day like that, you can help but love seeing those beautiful graceful white pieces of plastic circling in the picture perfect sky. Thanks to Nigel Molyneux for parting with the model. It fly’s magnificently!!! Time to bring her down after a 20 minute first flight. With the sphincter puckering, she touched town for a long landing roll (I think I’ll set up the wheel brake for landing, It may help me out of trouble or at least give me additional confidence if I come in a bit hot). It was a great day, but it was just about to get better, Combat!!!!!! Several guys had their foam electric combat ships with streamers attached. At first I was under the impression that they would be trying to cut each other’s streamers. But NO, they were up for carnage!!!! At finally after about 15 mins, two of the little mosquito sounding models hit. It was awesome. Then it was off to dinner. For $10 BBQ roast meat on roll with gravy!!! Yum, red wine and healthy discussion about the events of the day. But wait there is more!!!! The call came “Night combat!!!!”. This was my first experience of night flying (watching), it is awesome and combine it with combat. Now you would think that it would be easy to get two RC models to hit each other…… but no, it went on for ages before we had carnage! It was a lot of fun and every one enjoyed themselves immensely. I know I did. God we are such big kids aren’t we!! The day dawned and was very foggy……………Not outside, in my head. I awoke to the sound of Neil and Lunney knocking on my hotel door. A quick coffee at Macca’s and down to the field for Bacon and Eggs. Jason is such a good host. It was a great day again, although the early lift wasn’t there on Sunday morning. However at about 1:30 it was awesome, again high level cloud but constant smooth lift and my 2C was again aloft for what seemed like an hour. I tried moving across the field from the lift of the landfill to the trees behind the flight line. It was good steady lift. With the cool conditions the air was thick and gave the transition between thermals minimal sink. As I had to return to Melbourne that evening I only had a couple of flights but they were well worth it. I hear there are whispers of making this an annual event. I would make the trip every year for sure. The Moira club is a gem. For those of you who haven’t been there (like I hadn’t), get yourselves up there. The members are welcoming and there are many excellent flyers who are keen to assist and pass on their knowledge. A great bunch of guys. I heard of a recent media article which actually was rather different to my experience. Sometimes people forget what this hobby is about. Getting together and having a good time which we did. Thanks to all those that made this a fantastic weekend. After David left for Melbourne on Sunday afternoon due to work commitments we decided that a Chinese banquet would be a fitting end to a day of wonderful flying. Andy, Steve, Jason, Colin and myself spent a relaxing couple of hours working our way through Banquet-B and a few reds at Cobram’s finest. Monday morning dawned fine and calm yet again so we headed out to the field for another day of soaring fun. The early morning thermal were quite light at first but built up towards mid-day. A steadily increasing cloud cover appeared to foretell poor soaring conditions however the thermals were still about and I managed my best flight of the weekend at nearly an hour. Surprisingly the cloud cover dissipated later in the afternoon and we continued flying much later than we expected given the long drive back to Melbourne (for some). Jim Houdalakis dropped in on his way home from the Jerilderie F3J meeting just as we were about to pack the models away and he accompanied Steve and I on the trip home. The only significant downside of the weekend was the crash of Andy’s HOTS tug which went in after a loss of orientation at low level. A very sad end to a tug that had done much to revive aero towing in Melbourne in its earlier life. We had some great fun combatting on Saturday, I had contact with Andy, ripping the motor off the front of my “original” combat model, 5 minutes later with the help of foam friendly cyano and kicker I was test flying again!. On Sunday we flew another round and I was solidly taken out again, and this time there was to be no resurrection. All good fun, as these models are designed to be quick to build and replace. Saturday night was night flying, and again we had a great time, we (the Melbourne guys) got to see the Radian night flyer for the first time, this is a hunter of the highest order, and you need to stay aware of this one…) We got a couple of rounds in with all having a great time. Mondays towing got off to a poor start with Jase having an issue with his 120cc tug after just a couple of tows, the gremlins could not be sorted there and then so pugnee was retired for some maintenance (she did a lot of towing on sat and sun), We still had Neil’s 5m ASW15, Jase’s 6m ASG29 and the two 3.5m K8s. It was time to step up, I had towed Neil’s 15 earlier in the weekend so knew the extra was doing ok, but Jase was keen so off we went with a 50cc aerobatic model towing a 6m carbon reinforced beast of a sailplane. Well, what was all the stress about, easy, just don’t tow steep. We ended up having a great day, I got some further great towing experience, the boys got lots of glider flying, we played a lot with the new Replay cameras (See Oz Scale Soaring on facebook or http://www.scalesoaring.com.au/ for video). Food, did anyone mention food, awesome roast on Saturday night, cinnamon donuts (cold or roasted on the fire), Bacon and eggs for breakfast, hamburgers and sausages for lunch, seriously, why would you ever leave this club and field. I have been coming up for the last 4 or 5 years for the main Melbourne Cup event, but hear that the June long weekend may become another regular scale fun fly event, that will be great. Also great to see that this weekend had all sorts of models flying, helicopters, combat, electric scale, trainers, aerobatic, electric glider, hand launch, edf, and of course the scale sailplanes. All happily coexisted and made the weekend fantastic. This club is one the best setup and most welcoming full stop, this is why I became a member last year and look forward to continuing that for a long time to come. In Spirit, but not in body Henryk Kobylanski.